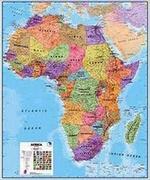 Africa maps from Omnimap Map Store: travel maps, hiking maps, wall maps, cycling maps for the world. Africa Travel Maps. Folded travel, political, and physical maps. For more detailed series see each country listing. Africa Physical and Political Wall Maps. Flat or laminated wall maps. Africa Historical Political Wall Maps. Reprints of historic maps from National Geographic Society. We have a good selection of thematic maps of the continent of Africa, which are listed below. We also have a good stock of thematic, topographic, and travel maps of the individual countries. The ex-British colonies tend to be better mapped than the ex-French, ex-Portuguese, or ex-Belgian colonies. Please see the individual listings for the following countries for more detailed mapping. Africa Overland: Cairo to Cape Town Travel Atlas. 1:3,400,000. ITMB. This atlas portrays the classic eastern route from Cairo to Cape Town over a hundred pages of maps. It covers 14 countries and gives advice on particularly sensitive travel areas, such as between Egypt and Sudan. We do not show only one recommended route, as there are alternatives once one reaches Kenya, but all are shown. The great advantage of this book is that it is compact and easy to carry, as well as being as accurate as we could make it. Africa Travel Map. 1:5,000,000. ITMB. The folded map covers all of Africa in a single double-sided sheet - ideal for planning trips or getting an overview of this amazing continent. The map is available in both folded and flat (wall) versions - see below for the wall version. The northern and western part of Africa is on one side and the eastern and southern portion on the reverse (see examples below). $14.95 66-17509 1 sheet, folded. $24.99 66-17509R 1 sheet, flat. $44.99 66-17509RL 1 sheet, laminated. Africa Travel Map. Kümmerly + Frey. Detailed political and road map of the continent. This is the only folded single-sheet map of all of Africa that we offer. Multilingual legend. $24.99 66-17501 1 sheet, folded. Coastal West Africa Road Map. 1:650,000. Reise Know-How. This map combines topographic mapping with road and tourist detail. The road information is clear and elevation is shown using contours, spot heights and altitude shading. The map shows six different types of roads, highlighting scenic routes, places of interest, archaeological sites, monasteries, monuments and viewpoints. Includes coverage of: Benin, Burkina Faso, Cabo Verde, Cote d'Ivoire, Gambia, Ghana, Guinea, Guinea Bissau, Liberia, Nigeria, Senegal, Sierra Leone, and Togo. $15.99 66-17902 1 sheet, folded. Inland West Africa Road Map. 1:650,000. Reise Know-How. Includes coverage of: Mali, Mauritania, and Niger. $15.99 66-17904 1 sheet, folded. Africa Travel Map Series. 1:4,000,00. Michelin. This is an excellent three-sheet series that covers all of Africa. $12.95 66-1775 Northwest Africa travel map. Michelin #M741. $12.95 66-1776 Northeast Africa travel map. Michelin #M745. $12.95 66-1777 Central and Southern Africa travel map. Michelin #746. Africa Travel Map Series. ITMB. This is a new three-sheet series that will eventurally cover all of Africa. Front of the East and Central Africa map. Reverse side of the East and Central Africa map. Sample detail from the Southern Africa travel map. $12.95 66-17515-EC East-central Africa regional travel map. 1:3,400,000. $12.95 66-17515-EQ Equatorial Africa regional travel map. 1:3,400,000. $12.95 66-17515-N North Africa regional travel map. 1:3,400,000. $12.95 66-17515-NE Northeast Africa regional travel map. 1:3,800,000. $12.95 66-17515-NW Northwest Africa travel map. 1:3,800,000. $12.95 66-17515-SC South and Central Africa travel map. 1:2,200,000 / 1:3,400,000. Sahara Travel Map. 1:3,400,000. ITMB. The map covers the northern portion of Africa, from southern Morocco and Mauritania in the west to Egypt in the east, and from the Mediterranean coast south to partway through Niger, Chad, and Sudan. Indexed, with a glossary of arabic terms, and with short paragraphs on points of interest. Printed on both sides. Map size is 27 x 39 inches. New Political Map of Africa. 1:10,000,000. Tourist Maps Kenya. A classic base map of Africa, showing country borders highlighted in black, rivers and major geographic features, main roads and cities, etc. With a 5 degree latitude/longitude grid. Africa is the world's second largest and second most populous continent after Asia. It is the home of 53 independent countries, over 1000 languages and 797 million people. Africa covers 5.9% of the earth's surface and 20.3% of the total land area. It is the oldest inhabited territory on earth with the human species originating from this continent. $16.95 66-17506 1 sheet, folded. Muslim World Map. 1:35,000,000. GEOprojects. Side one has a Map of the World showing international boundaries and settlements with countries colored according to percentage Muslim population. Side two has a chart showing Muslim population totals and percentages in each country. Size is 44 x 78 cm. Sample detail from the Muslim World map. $12.95 67-10912 1 sheet, folded. Map of the West Africa National Parks. Variable scale. IGN, France. This map has shaded relief maps for the national parks in several west African countries. In French. Illustrated Road Atlas of Africa. 1:3,500,000. Map Studio. 1st edition. Beautiful road atlas of Africa. There are 47 pages of maps over all of Africa. There are 16 pages of maps over tourist areas/national parks. There are 36 pages of street maps over the major cities of Africa. And, there's a 13 page index to place names. Spiral bound. Southern Africa Road Atlas. Map Studio. A good road atlas covering the southern half of Africa. 116 pages, softcover. African Adventure Atlas. National Geographic/Rand McNally, 2001/2003. This atlas divides the African continent into 15 geographical regions which are introduced over 30 pages and serve to lead the reader into the sections of the atlas, comprising National Parks, town plans and adventure activities. For ease of reference, color-coded "tabs" clearly identify the different sections. Ultimate Africa Atlas. Map Studio, 2007. The Ultimate Africa Atlas covers 57 countries of the continent, it includes traveling tips, information on the cultures within the countries and the environment across all featured places. This color-coded atlas features activities, places of interest, entertainment, climatology, awareness of risk factors, important facilities and it gives a guide on the ideal wardrobe to pack for each and every country featured. Africa Political Map. National Geographic Maps. One side has the classic political map. Small size is 24" x 31", large size is 46" x 36". Africa Wall Map - Executive Style. National Geographic Maps. Our executive style political map of Africa features country boundaries, place names, bodies of water, airports, major highways and roads, and much more. Size is 24 x 31 inches. Africa Political Wall Map. 1:8,000,000. Maps International. Size is 39 x 47 inches. $44.99 66-17498L 1 sheet, laminated. Africa Physical Wall Map. 1:5,000,000. ITMB. This wall map covers all of Africa in a two single-sided sheets - ideal for getting an overview of this amazing continent. The northern and western part of Africa is on one side and the eastern and southern portion on the reverse (see examples below). $24.99 66-17509R 2 sheets, flat. $44.99 66-17509RL 2 sheets, laminated. Northwest Africa Political Map. National Geographic Maps. Stunning, large-format print from the award-winning National Geographic World Atlas. These finely-detailed, informative maps are perfect for home, office, or school. Expand your world with this stunning print of Northwestern Africa. Includes country boundaries, cities and towns, parks and game reserves, roadways, major geographic features, lakes, and waterways. Available in two sizes, 29 x 36" and 36 x 48." Northeast Africa Political Map. National Geographic Maps. Stunning, large-format print from the award-winning National Geographic World Atlas. These finely-detailed, informative maps are perfect for home, office, or school. Includes country boundaries, cities and towns, parks and game reserves, roads, major geographic features, lakes, and waterways. Available in two sizes, 29 x 36" or 36 x 48." Southern Africa Political Map. National Geographic Maps. Stunning, large-format print from the award-winning National Geographic World Atlas. These finely-detailed, informative maps are perfect for home, office, or school. This beautiful print of Southern Africa includes country boundaries, cities and towns, parks and game reserves, roadways, major geographic features, lakes, and waterways, plus a large-scale inset of Madagascar. Available in two sizes, 29 x 36" or 36 x 48." Africa Map 1909. National Geographic Society. This map is a reprint of the NGS Africa map published in 1909. This historic map of Africa takes you back to 1909, a time when the "Dark Continent" was barely known in the outside world. A time when the only way to get to far off places like Abyssinia, the Congo State, and Bechuanaland Protectorate was to take a long sea voyage, then travel many miles by rail. National Geographic was among the first to bring this amazing land to the world, and this incredible map provides a time capsule into these times. Artistic cartography and painstaking detail make this a map for any collector. Country boundaries that show Independent Territories and Congo State, along with territories under control of Egypt, England, Germany, Spain, Italy, Turkey, France, and Portugal. $19.95 66-17495 1 sheet, flat, laminated. Africa Geologic Map (Carte Géologique Internationale de l'Afrique. 1:5,000,000. Geologic Map of the World, CGMW, France. This Geologic Map of Africa is in 6 sheets. Bilingual; sheet size 92 x 94 cm. Map Showing Free-Air Anomalies off the Western Coast of Africa. 1:500,000. U.S. Geological Survey. 1990. Black and white maps. $6.95 66-1412L Liberia to Ghana. $6.95 66-1412N Nigeria to Gabon. MF-2098-D.
$6.95 66-1412S Senegal to Sierra Leone. MF-2098-F.
Africa Tectonic Map (Carte Tectonique Internationale de l'Afrique). 1:5,000,000. 1969. UNESCO. Nine sheets illustrate the tectonics of the continent; with explanatory booklet. Sheet size 93 x 68 cm. In French. Note the large discount for purchasing the whole set. Northern Africa Quaternary Geology. 1:2,500,000. 1973. UNESCO. Three sheets depict the Quaternary geology of northern Africa. Sheet size 100 x 70 cm. Map of Quaternary Deposits in Africa. 1:5,000,000. 1986. VNIIzar. Nine trilingual sheets with 87-page Russian text. Africa Hydrogeologic Map (Carte Hydrogéologique Internationale de l'Afrique). 1:5,000,000. 1989. OAU (CGMW). This, the first of 6 sheets that will give complete coverage of Africa, covers NW Africa. With 140-page text. In French. West Africa Gold Deposits. 1:2,000,000. 1989. BRGM, France. This bilingual map shows west African gold deposits in their lower Proterozoic lithostructural settings. With 96-page French text. West Africa Energy Map. 1:600,000. Petroleum Institute, U.K. 1993. With inset charts and graphs on exports, principal fields, oil & gas production, pipelines, and contracts. Laminated, flat sheet. Occidental Africa Geologic Map (Carte Géologique). 1:2,000,000. 1960. BRGM, France. Detailing the geology of northwestern Africa; includes Ivory Coast, Guinea, Senegal, Mali, Niger, Mauritania, Upper Volta, and more. Nine sheets, each 75 x 54 cm with French legend. Sheet 6 is out of print. Geologic Map of the Hoggar Massif. 1:500,000. 1962. BRGM. Provides detailed coverage of the geology of the central Saharan region, including parts of Mali, Niger, and Algeria. The 12-sheet map comes with a 100-page French text. Southern Africa Geological Map. 1:5,000,000. 1985. Geol. Soc. South Africa. Includes Zimbabwe, Botswana, Mozambique, Namibia, and contiguous areas. 76 x 51 cm.